My first experience with Terrence Malick was in high school when I saw The Thin Red Line in theaters. I remember really disliking it at the time, but I don’t think I knew exactly what I was getting myself into with that film. I wouldn't mind revisiting it now as I would probably have a different opinion about it. Malick is a very particular kind of writer and director. He has made six films since his first film, Badlands, was released in 1973. I have seen all but one of them and have really grown to have a respect and admiration for his work. Holly (Spacek) is an innocent fifteen year old that can be found twirling her baton in her front yard of a small South Dakota town. Kit (Sheen) is a local garbage man that is a bit flirtatious with Holly in his dingy white t-shirt, jeans, and jean jacket. His James Dean looks and charm quickly wins her over, and they embark on a relationship. There is this aura about him being from the “wrong side of the tracks”. Her father (Oates) wholeheartedly disapproves of their relationship as he is twenty-five and significantly older than Holly. After Father threatens Kit to stay away from her, he shows up at Holly’s house and shoots her dad. Oddly enough, Holly doesn’t seem as phased by it as you would think for someone that watched her dad get shot by her boyfriend. Kit and Holly decide to fake their suicide by burning down her house and leaving a suicide message behind. They leave town and begin their new life as nomads while on the run. While living in a treehouse, Kit kills some men that find them as it becomes apparent that people are now looking for their whereabouts. Holly continues to put this blind faith and trust in Kit. It’s only after his seventh kill that she starts to get nervous around him, not knowing what to expect next. The film was inspired by the true life killing spree of Charles Starkweather and his girlfriend Caril Ann Fugate. 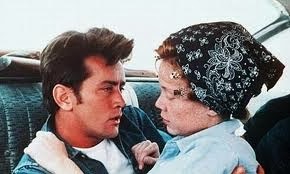 Malick was fascinated with them but didn’t want Badlands to be their story. He didn’t want Spacek to do research on Caril Ann Fugate. Malick wanted these two characters to feel like everyday people. Kit was portrayed as a likable guy. He was not treated as a maniacal psychopath with mental issues. Instead, he is your average boy next door with charm and sense of humor about himself. Sheen credits all of those decisions about his character to Malick. Holly is this light, airy, and innocent young girl who falls smitten with him like any normal girl would do. There is a decent into panic with both of them, but Malick writes their shift in character so smoothly and naturally that you don’t quite realize the breakdown until the end. You never see that sudden shift into a crazy maniacal killer that typically occurs halfway through these types of movies. Sheen and Spacek were relatively unknown at the time. This film came three years before Carrie made Spacek a household name. To enhance this idea of a slow progression for the characters, she carefully ages her character the longer they are on the run. In those first few scenes she definitely looks like a young wide-eyed girl, but she starts to mature and grow up in this new life of hers. She is no longer daddy’s little girl twirling the baton. Sheen mentions in the “making of” documentary that it was “by far the best script I had ever read”, but felt he was way too old for it. He apologized to Malick for having to turn it down, but Malick was so insistent on Sheen playing Kit that he ended up writing the character a bit older to make it work. It’s been forty years since Badlands’ release. For being Terrence Malick’s first feature film, it is apparent that his artistic choices and style were already in place. 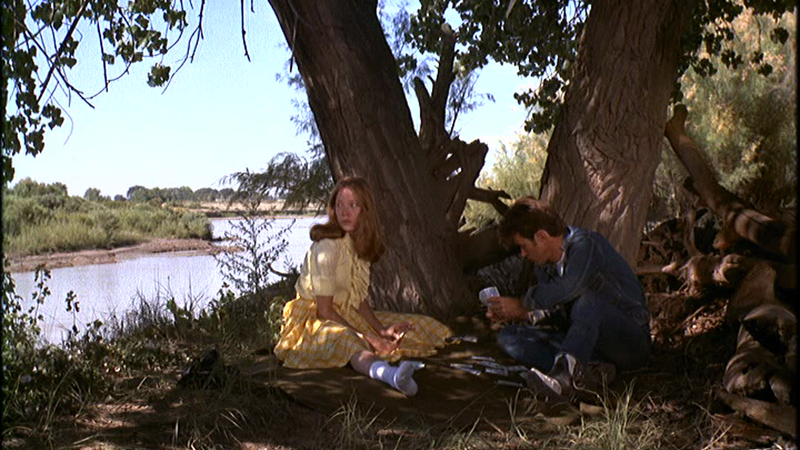 Art director Jack Fisk, who later married Sissy Spacek and has worked on all of Malick’s films, stated that other members of the Badlands crew weren’t as familiar with Malick’s way of working. They wanted to blame his inexperience as reasons for a disastrous shoot and lack of focus, but that was actually his way of working. If you have seen his latest films like 2011’s The Tree of Life or 2013’s To the Wonder, you are familiar with Malick’s vision. Some may find those films hard to watch as they require a different kind of focus or patience for the moviegoer. 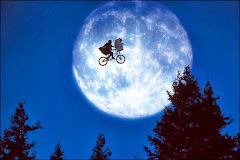 I would like to say that this film is a bit more accessible than those are. You can easily draw parallels and see similarities in his work despite the decades that have passed. Holly’s neighborhood seemed oddly reminiscent of the town used in the flashback scenes in The Tree of Life. Malick has a way of incorporating nature into his films and makes it a vital aspect to the characters and world of the story. 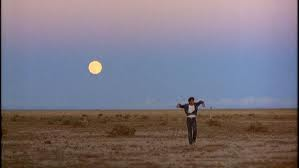 The cinematography in Badlands is quite exquisite at capturing that desolate and dusty atmosphere. There is a beautiful shot of Sheen holding his rifle against the sunlight. I also love his close-ups on the animals in each of the movies. Another Malick trait is the use of voice-over in his films. He was very much influenced by Truffaut’s The Wild Child. 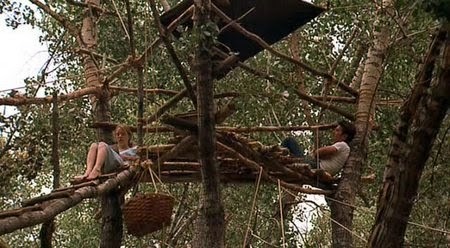 In Badlands, he has Spacek narrating Holly’s thoughts on her relationship and journey with Kit. Malick is no stranger to The Criterion Collection. His films are perfect for their mission. The director approved blu-ray special edition includes a new, restored 4K digital transfer. 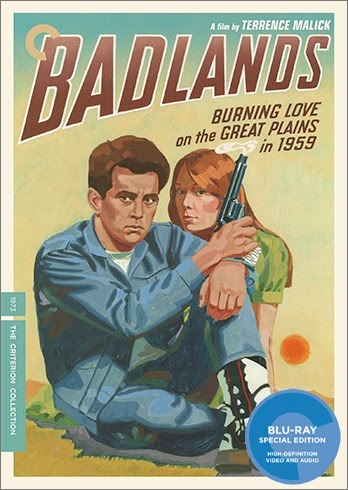 Spacek, Sheen, and Fisk are featured in a “Making Badlands” documentary. There are interviews with associate editor Billy Weber and executive producer Edward Pressman. There is an episode of the television show American Justice about Charles Starkweather and Caril Ann Fugate. The last feature worth noting is an essay about the film written by Michael Almereyda. There are many films about a couple on the run from the law, yet I was completely drawn into Badlands. Sheen and Spacek are so young in the movie, yet are perfectly capable of carrying the film while taking us on this strange journey of these two people who seem fairly ordinary on the outside yet have this complacency about killing people. Like I mentioned in my review of Wes Anderson’s Bottle Rocket, I always find it fascinating to go back to a director’s first film. Both of these artists are writers and directors who have a specific look and feel to their films. When you are more familiar with their later works, it’s fun to go back to see where it all started and to notice a distinct voice already taking shape. Is it worth your trip to the movies? This may just be my favorite Malick movie.